Roman-riding while jumping one of his signature Ford vehicles. Photo courtesy Raymond Museum. 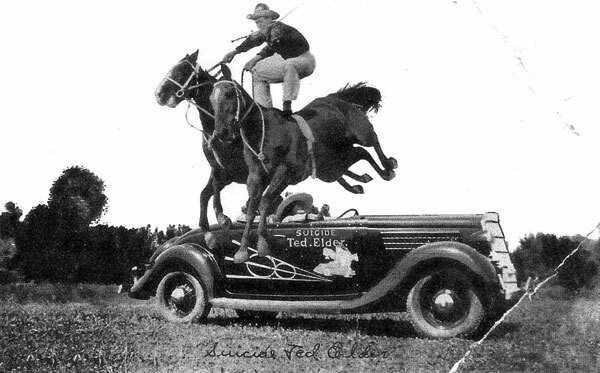 Ted Elder was one of the most daring horseman who ever lived. He was born October 9, 1897 in Hinckley, Utah, the son of Jonathan and Bertha Ann Dewsnup Elder. The family moved to a homestead ranch near Raymond, Alta., when Ted was about four years old. Ted was born with a love of horses, and so upon reaching military age, he and his brother joined the NWMP. When WWI came along, the two brothers left the Mounties and joined Lord Strathcona’s Horse Cavalry. The armistice was signed before they deployed. Soon they were back on their father’s Alberta ranch, but this was now too tame for Ted. He left home intending to go to South America. To pay his passage he worked on the Seattle docks. Then Ted saw a poster for the Pendleton Roundup and was intrigued. He never even went back to collect his wages. “Suicide” Ted Elder, Seven-Time World Champion Trick Rider. Photo courtesy Raymond Museum. By 1920 he was working on a ranch near Pendleton. When he saw the trick riders perform at the Roundup, Ted knew he’d found his calling. He perfected his skills and soon headed to Denver where he won his first trick riding championship. 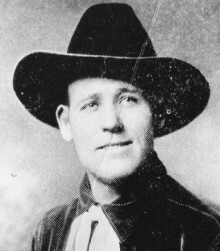 He performed at the 1923 Calgary Stampede and then competed in England, where he took second place. In 1925 Ted joined the Ringling Brothers Barnum & Bailey Circus. 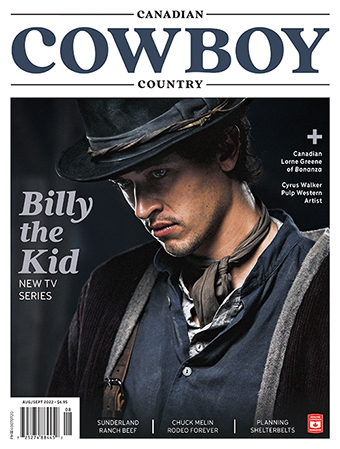 There he got the polishing he needed and became the featured star. He told John Ringling that he wanted to go back to Madison Square Garden in New York to try for the championship again, and Ringling was enthusiastic. He offered Ted the horse he had used in the circus. In fact, the head of the “Greatest Show on Earth” not only sent this horse by special baggage car to “the Big Apple”, but upon its arrival had it met by six matched greys pulling an ornate circus wagon. Ted’s horse was placed inside, and regally rode the streets of New York as if he were the “king” of horses. It was only a one-wagon parade, but the sophisticated New Yorkers gaped and realized that something new had come to town. For two weeks this horse went through the tricks he had learned so well. On closing day the riders competed for the championship. They drew lots and then went into the arena in rotation, performing their own individual tricks, which the one following must perform in addition to his own?—?and the one following must do this successfully or be automatically eliminated from the contest. When several men are competing this can add up to quite a lot to master, and Ted was far down on the list. He had to do everything that had been done before his entry and then he performed his own special act. The man Ted followed into the arena was a champion in his own right, but Ted managed to do everything the champion had done. Then, bracing himself for the finale, the champion and Ted did five runs around the arena, doing all of the other competitors’ tricks and then adding his own specialty at top speed. Ted’s trick consisted of turning backward in the saddle, diving down between the horse’s hind legs and with his head beneath the dock of the horse’s tail and his heels dragging in the dirt. He then flipped himself back over into the saddle, and astonishingly, turning so he landed facing forward. Roman-riding while jumping one of his signature Ford vehicles. 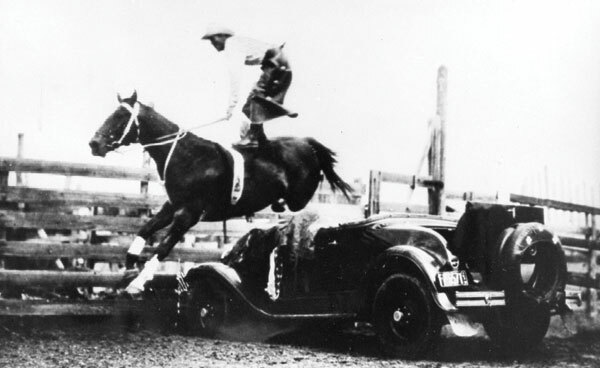 Ted Elder jumping a vehicle while standing on one of his Irish Hunter horses; an extremely difficult feat. Photo courtesy Raymond Museum. The crowd went wild. Buck Stewart, the champion, tried twice to do this trick and failed both times. Ted showed his sportsmanship by going over to Stewart in the ring and showing him how to fix his saddle strings so that he might do the trick. But Stewart could not complete the crucial turn and rode out of the arena, leaving the championship of 1926 to “Suicide” Ted. Ted held his title, Champion Trick Rider of the World, for seven years, retiring undefeated. Leaving Ringling Brothers Circus, he signed on with the 101 Ranch Show. It was during this time that he broke and trained two Irish Hunters to jump over an automobile while he stood on their backs, Roman-style. 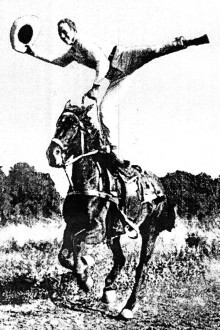 Ted Elder waving his hat while doing a one-leg stand on a galloping horse. Photo courtesy Raymond Museum. In 1932 Ted went on a tour of Sweden, Denmark, Belgium, Holland and France. Upon returning to the States, he performed with the Cole Brothers and the Clyde Beatty Circuses. He then returned to London with his Irish Hunters to open Tex Austin’s World Champion Rodeo. During 1934?–?36 Ted played the rodeo circuit for Coburn and Sorenson. In 1937 he broke his leg at the hip when his horse slipped, throwing him into a rail fence. Ted was already booked for spring, but the leg was very stiff. However, he still went to Australia for the Royal Easter Show. He did not take his own horses but got an untrained horse ready for showing in five weeks’ time. Ted tried retirement—but once a showman, always a showman, so he went out to California, got a job with Gene Autry, and trained the famous horse Champion (officially Champion, Jr. 1942?–?1977) which Gene used in motion pictures. This astonishing horse mastered thirty-eight different tricks under Ted’s tutelage. In his twilight years he did a little ranching and worked as an extra in some Westerns. Tom Mix, Hoot Gibson, Will Rogers and many other stars were close friends. In retirement, he loved to reminisce about the “old days” when the crowds cheered, the music blared, and the noble horse competed, using his wits and strength in harmony with the man on his back. Sincere thanks to the Raymond Museum in Raymond, Alta., for allowing access to their research and collection on hometown hero, “Suicide” Ted Elder.